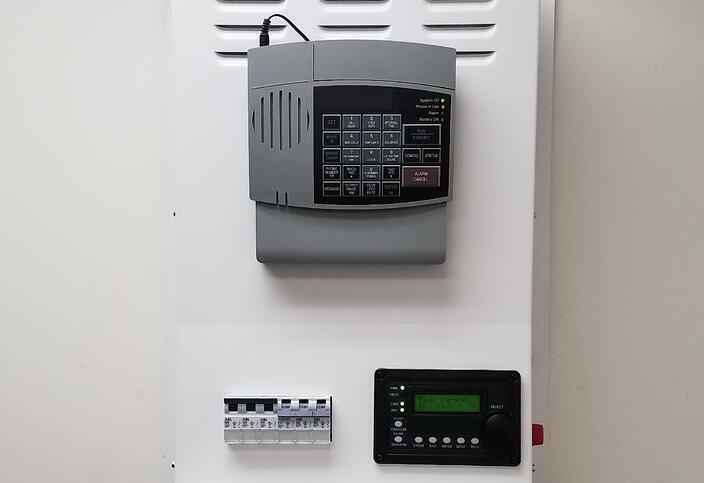 Vaccine fridge battery backup systems that are equipped with power outage alarms, need to be programmed after installation. Setting up the Sensaphone alarm involves 3 parts: 1 setting up the hardware, 2 Connecting the phone line, and 3 programming the system. Being the alarm is already fastened to the battery backup cabinet, there is not much set up other than installing the batteries. The batteries are installed by sliding down the lower cover below the keypad of the unit, which slides down off the bottom. The system needs to be connected to a standard analog telephone line. We recommend you have a dedicated telephone line for the alarm - this way the alarm will not interfere with whatever else is connected to the alarm system. This connection is made by connecting a standard 4 pin telephone cable into the 4 pin RJ-11 socket at the top of the alarm. There are several steps to programming the system. The following is an outline of each step. Set the Dial Out Numbers: These are the telephone numbers will system will call once the power to the vaccine refrigerator goes out. You can program up to 4 phone numbers for it to dial. Record the Alert Message: Recording a message for each Zone and alarm that is used will help you identify what location and problem is alarming. Confirm that Zone 2 is the utility power loss by briefly unplugging the battery backup system's input power. Once you unplug the backup system from its power source it should say "alarm zone 2 it is not OK". So that you do not have to remember what zone is what, record a message for the zone. Hook up the Temperature Sensor: Place the temperature probe in a central location. Inside the fridge and run the wire thru the refrigerator door and over to the alarm. Flip down the lid at the top of the alarm. You will need a small flat blade screwdriver to hook you the wire to the terminals C and 4 (the first 2 screws if you go from left to right). Configure Zone 4 to temperature: This will configure your Zone to read the temperature. Note down the temp it says it is for Zone 4 and compare this with what the Datalogger is reading. Whatever the offset is will needs to be programmed in so it matches what the data logger reads. Congratulations - you have completed your programming for the Vaccine Storage Power Outage and Temperature Alarm System!